Wessex Garage Doors have over 25 years’ experience in the supply, installation and repair of superior garage doors from leading brands, including Cardale garage doors. As one of the major garage door companies in Sussex, Surrey and Kent, we are able to satisfy any requirements you may have. Customer satisfaction and service is very important to us, which is why all our garage doors come with a 12 month warranty and our price promise guarantee. They also have secure locking as standard, and virtually any door can be automated for the ultimate in convenience and security. Get a free, no-obligation quote by completing the quick form on this page. With over 50 years’ industry experience, the British company Cardale has built up an enviable reputation in the manufacture of high quality garage doors. The company’s product portfolio spans a huge varieties of garage door types and over 50 styles that can be mixed and matched to create truly individual solutions to complement any home. Should you be unable to find exactly what you are looking for, Cardale can also create bespoke manufactured garage doors. Using the most popular style of lifting gear, up and over garage doors represent the best in terms of security, safety and durability. Doors come in a vast range of styles and can be automated on request. Vertical opening for ‘park right up’ convenience, with an extremely smooth lifting mechanism gives sectional garage doors their unique benefit. 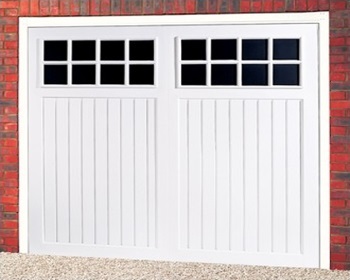 Traditional operation side hinged garage doors provide excellent security, durability and low maintenance, with the option of additional automation. Roller doors open vertically and are stored in a compact coil above to save space. Personnel side doors come with a euro profile night latch and deadlock and four anti-drop bolt hinges for extra security. Premium grade galvanised steel are a cost effective solution, providing both security and rust resistance. A wide range of paint and wood effect finishes are available. Robust and durable GRP composite is virtually maintenance free and comes in a choice of white gloss or timbergrain woodtones. Insulated aluminium laths in a selection of finishes and sizes provide protection against the cold and wind. Handcrafted timber using cedar from managed sustainable sources are hand finished in a choice of colours or woodtone. Impact resistant white ABS is virtually maintenance free. Our friendly team is always happy to answer any questions you may have regarding garage door installations, automatic garage doors or door repairs. For any enquiry about Cardale garage doors, please call us on 0800 161 3733 or email info@wessexgaragedoors.co.uk.